Texas head coach Tom Herman said his team is still a work in progress after the first two games of the 2018 season and he expects the Longhorns to take another step forward when they host No. 22 USC on Saturday at Darrell K Royal-Texas Memorial Stadium in one of the college football campaign’s most anticipated showdowns. Herman’s sentiments mirror those of USC head coach Clay Helton — the best is yet to come for his team. Both the Longhorns and Trojans are 1-1 on the season and still trying to find out just how good they are going to be. Saturday’s game will be a thorough examination in the most pressure-packed of situations. Texas comes into the game with the Trojans on the heels of a tougher-than-expected 28-21 home win over Tulsa. Quarterback Sam Ehlinger finished 21-of-27 for 237 yards with two touchdowns and fumbled once against Tulsa but played well overall, especially at the end of the game when he engineered a 13-play scoring drive with the help of some check-down passes, including one on Texas’ final score. Ehlinger had two crucial interceptions in the fourth quarter in the Longhorns’ season-opening loss to Maryland on Sept. 1 and seemed none the worse for wear last week. “Sam played really, really well, really well, managed the game well, checked us into some really good plays versus blitz,” Herman said. “He handled the tempo well, he handled the uniqueness of Tulsa’s defense well. Helton said Tuesday that true freshman quarterback JT Daniels is progressing well after sustaining a bruise to his right (throwing) hand during Saturday’s loss. Daniels hit on 16-of-34 passes for 215 yards in the defeat and had two interceptions in the fourth quarter as the Trojans were trying to get back into the game late. USC outlasted the Longhorns 27-24 in double overtime at the Los Angeles Memorial Coliseum in 2017 when Ehlinger, making his first college start, fumbled near the Trojans’ goal line. It was the first meeting between the two teams since Texas beat the Trojans in the 2005 BCS National Championship Game in the Rose Bowl. The Trojans don’t recognize that game as a loss because that season’s results were vacated by the NCAA when it decided star running back Reggie Bush received impermissible benefits. 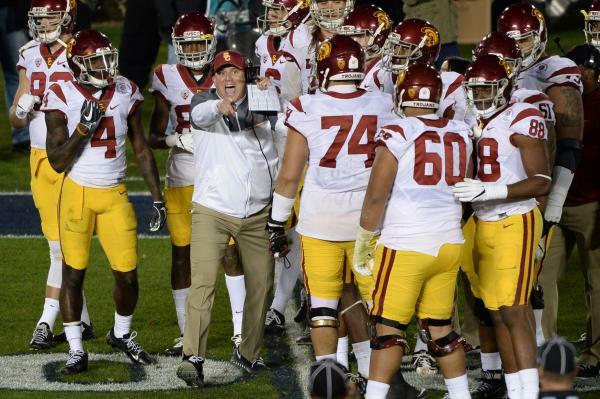 Without that loss counting, USC is now 5-0 against the Longhorns, according to the Trojans. Texas’ game notes state that Saturday’s game is the seventh all-time meeting and that USC holds a 5-1 series record.